1. Start by making the dressing. Place all the ingredients in a bowl and whisk together, or place in a clean jam jar, seal and shake well then season. 2. Next blanch the broccoli for 2-3 minutes, drain and set aside. Heat the olive oil in a large frying pan and add the garlic and chilli. When the garlic starts to turn a pale gold colour add the broccoli, stir fry for 2-3 minutes and season. Set aside and keep warm. 3. Place a large, non-stick frying pan on a medium heat to preheat for 3-5 minutes. Scrape a sharp knife along the fish skin to ensure all the scales have been removed. Make 4-5 incisions in the skin in the middle of each fillet. Brush the skin with vegetable oil and season. 4. Cook the fish in the hot pan, skin-side down and without moving for 5-6 minutes or until you see a golden ‘halo’ around the fillet edges and they are three-quarters opaque. Turn the fish over, turn off the heat and squeeze the lemon over the top. Leave in the pan to rest for 3 minutes. 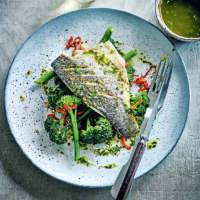 Serve the fish on a bed of broccoli with dressing spooned over.